APR Plus Now Supports the 3.0 TFSI! We’ve extended APR Plus to include all 3.0 TFSI engines still under the original Audi Limited Powertrain Warranty! This includes Audi S4, S5, Q5, SQ5, A6, A7 and A8 Models. APR Plus give you a factory term limit matching Limited Powertrain Warranty on top of our APR Plus ECU Upgrade to give you peace of mind when tuning. Visit www.goaprplus.com and select your vehicle to learn more! GO APR! 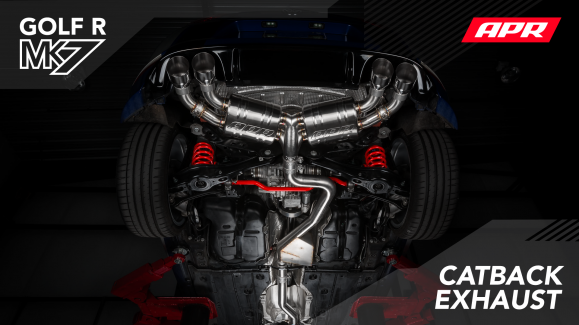 APR Presents the MK7 Golf R Catback Exhaust System! APR MK5 2.0T FSI Software Update and Sale! We’re excited to announce an all new versions of our MK5 2.0T FSI EA113 Stage 1, 2 and 2+ ECU Upgrades! These all new ECU Upgrades are the result of over a decade of tuning experience on the 2.0T FSI EA113 engine and incorporate all of our latest tweaks for power, drivability and safety. To celebrate, the ECU Upgrades and various related hardware items are on sale from May 14th to June 17th at all APR dealers in the USA. First 2.5 TFSI EVO in the 9’s with a 9.83@144.39 MPH!